Christopher Herz was born in New York, but grew up bouncing up and down the coast of California. At the age of 8, after experiencing the reaction of his third grade class to a story he had written and read aloud, Herz knew he wanted to be a writer. Returning to New York as an adult, he was inspired by his neighborhood in Sugar Hill, Harlem and began drafting his first novel, The Last Block in Harlem as a love letter to his block. 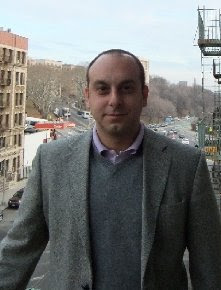 Herz left his job upon finishing the manuscript, and began hand-selling his book throughout New York City. Walking the streets each day until he had sold 10 copies, his hand-selling caught the attention of Publishers Weekly, which featured Herz in an August 2009 article. The attention from the article garnered Herz a publishing contract from Amazon Encore. The national release of his first novel is due out July 13th. Urban Reviews: Tell our readers about The Last Block In Harlem. Christopher Herz: Set literally on the last block in Harlem (St. Nicholas Place between 153rd and 155th), the book explores what it takes to stay clean in a world that just won’t let you do so. It’s strange, because everyone who reads the book takes something different away from it. My intention is usually to have the reader walk around as the main character so they can feel, smell and touch the world that’s laid out in front of them. The book is a collection of the voices people from my neighborhood that presented themselves to me in the form of a novel. The book literally walked up to me and started writing itself in my head. I was just the vessel to get it out. I set out to show what it was like to go through the world as a man, but so many women have written to me and said they were really feeling what the female characters were going through in the book. I tried to put everything on the shelf like a grocery store and allow the reader to pick out what they wanted in their basket. Those who wanted to focus on how gentrification was changing the neighborhood got that. Those who wanted to go underground to St. Nick’s Pub and hear some music that cannot exist aboveground, listened to that. Those who wanted to get into the politics of deception enjoyed that piece of the journey. Those who liked old X Clan Lyrics sprinkled in throughout bopped their heads to that. And of course, the love story. Others just sat on the wall and ate Chicken and Rice with the gypsy cab drivers. It’s all there. Up and down the block. UR: How did you come up with the idea for this novel? CH: The minute we drove off the George Washington Bridge from our cross country move, the story started coming to me. Though my grandparents immigrated to this neighborhood around 60 yeas ago, so there were always pieces of me here. The first thing I unpacked was my typewriter and I started sketching out pieces of it the first night we moved in on a milk crate. It was awesome. The keys rang out in the empty apartment. The major pushing point though was the trash on the street. I saw this kid eating a slice of Pizza and just toss the plate on the ground. I knew if I told him to pick it up, I’d get a “What the hell did you just say?” so I figured I’d tell it through story. People get it more when it’s entertainment. I was on my way to work and I thought what it would be like to quit my job and just sweeping up my block. I pictured the whole thing on the A train. In reality, I could never do that, but in a novel, well, it works pretty well. It’s the beauty of fiction. I took the notes I started writing on my first night in Sugar Hill and played those through. Pretty soon, the story started presented itself to me on the block. It’s like the voices that were moving up and down that block for years started creating a narrative. UR: Has writing always been a passion of yours? CH: Always. It was the only way I could ever connect with people in a way that I wanted to. I don’t really know how to do small talk. I kind of just dive in and want to show you what’s behind my eyes. In return, I like to know what’s going on behind yours. I found out early on that most people don’t like you to look that deep. However, when they read, they allow themselves to jump in and believe. I feel that every word is kind of a relationship with the reader – so I’m very careful to develop that throughout the work. I was the kid in school who was always in trouble and in the principal’s office for saying the wrong thing at the wrong time to the wrong person. When I went into the workforce, I found that I was given the same treatment. Nobody wants to feel anything while they’re working. So, writing, it allows me to share feelings with potentially everyone in the world. It’s intense and exhausting, but It’s also fulfilling. UR: Is there anything you would do differently in regards to your book? CH: That’s a very interesting question. I would say no because it’s the book that I wrote at that time and captured a moment. I would have liked to have more time to write it. By that, I mean that I wrote it between 5 – 7 every morning before I went to work. One day I’d like the time to write something epic with tons of research put into it, but that will come. This one – I rewrote it like 15 times with the help of two different editors, so I feel that the book that finally came out was the one I wanted. I wouldn’t put it out there if I didn’t think it was ready. Though when Amazon Encore picked it up and published it again, they had a professional proofreader take it to town. All hail the proofreader. I bow down. Once it went to press, I never read it again. It’s too much anxiety to read what I wrote after it’s all said and done. That one was my first child, so for me it was like, okay, I gave birth, now go out there into the world and do what you do. It’ll make it tougher. I’m proud of every word in there. Unless you have a way back machine, that’s my story and I’m sticking to it. You don’t have one, do you? UR: What are your ultimate goals as far as the literary industry? CH: That question made me think of the First Wu album when they asked Ghostface the same thing. For me, I’d just like the ability to write all the novels that are in my head. I really enjoy that form of writing, so I’d like to make a career of it. There are so many voices that need to be heard and so many stories to tell – I hope that by the time it’s all over, I have a stack of books finished that will amplify them throughout time. I’ve just signed with a publisher after my first go round with doing it myself, so I’m interested to see what’s going to happen with a team of people behind the marketing and mass distribution of the book. My goal is to be able to do this on a level where I can produce quality work that changes the way people see themselves in the world. My wife and I were talking about me getting a tattoo of a bookshelf on my arm and each time I finish a book, putting a new one inside the bookshelf. I guess my goal would be to hold that arm up to a mirror at the end of my life and say, Hell yeah. I did that. UR: What did you do to help prepare yourself for the release of your debut novel? CH: Well, the initial release of the novel, I prepared when I was at work. There’s always down time, so when that happened, I planned on what I would do when the book was actually finished and in my hands. I think I’ve been preparing for my first book to come out since I was a little buster with big dreams and an eye on the horizon. I think that every conversation I’ve ever had with each person I have come in contact with has prepared me. When I ride the subways, I look at people who are reading and watch how intense they are when in the middle of a story. I’m always looking at what people are reading rather than on concentrating on the publishing industry itself. I think that by doing that, I have a sense of what people are looking for. That was my marketing research. In addition, I was raised on Rap music and inside of Hip Hop culture. Here, you can see that people just did what they had inside of them and let the mainstream come to them. That mentality of starting at a grassroots level and bringing your work directly to the people, uncut, is something that always resonated in me. However, nothing could really prepare you for the business. You have to learn it all yourself as it happens. People will offer you distribution deals. These are hairy – anyone that charges you money for services is trying to play you. Just keep on the grind and get your work into people’s hands and good things will happen. Any money you invest don’t expect a profit on. Think of it as a marketing expense. I put myself in that mindset and it paid off. That being said, I looked at business models of Lawrence Ferlinghetti, Jay Z, Terri Woods, and read Russell Simmons Book “Do You!”. All of that helped, but the actual presence of your books stacked in the apartment called out to me to hustle as hard as I could and then push beyond that. Get yourself a good lawyer to look over everything. Langston Edwards, who represents me, read through every document over and over again before I signed anything. It’s important and worth every cent. UR: Are there any upcoming projects that we can look forward to? CH: Yes. I have three books in my head that I am dying to get out of me so I can sleep properly at night. I have one set in Mongolia – that’s my epic. I enjoy working on that because it’s tons of research due to the historical nature of it. That one is going to come when I have an entire winter to sit down and do nothing but write. Let’s hope that’s at the end of this year. For now, I’m working on something set in San Francisco during the early 90s playing against the switch from the analog to the digital era. It’s a period piece that I was very lucky to actually live through. That one I ‘m working through now. It’s taking shape. I’m pretty transparent about it though, and have been writing it on my blog so readers can see all the stages a novel takes. I have no idea what this is going to turn into, but I always tell people stories of what took place then, and they are begging me to write it. So I am. I think that will be done by the end of this summer. Lately, a lot of people on my block have been asking for a follow up to The Last Block in Harlem, but I’m not sure how that would work. I was thinking of doing a piece called Voices from the Last Block in Harlem – a non fiction piece where I just put down the real stories from people on the block. We’ll see. Once that book came out, everyone started walking up to me telling me their stories. I don’t know how to write non-fiction though. I was never much of a reporter. I’ve been working on and off for about a year with this New York based team of battle painters trying to merge painting and story. That’s on the way soon. Check out Pesuart.com to get a preview of his styles. I’m excited about this, but I’m trying to figure out how it all relates. This one is going to come out nice I think. UR: Who have you most admired in the literary world to date? CH: Lawrence Ferlinghetti, to me, is the Russell Simmons of his day. He branded a group of writers and a style of writing and brought people to him. City Lights Bookstore, and everything it represents, is a driving force inside of my soul. He wrote, published and afforded artists to make a living off of what they did. He battled the system and led a movement that still resonates with how people write today. I met him once on the streets of North Beach and vowed to one day come correct enough to have something in his store. Milan Kundera was a huge influence on me in regards to learning how to break literary rules and still stay true to the rules. He was introduced to me by Jodi B. Feldman, a very good friend of mine. I will never forget her for that. Who else? Ralph Ellison without a doubt made me fall in love with what was possible in a novel. Without reading him, I would probably still be writing poetry and putting it up on lampposts. He was the master craftsman and put out, what I believe, to be the greatest novel of the 20th century. Paulo Coelho sits on a mountain top inside of my chest and makes sure the lighthouse is on. Iceberg Slim – The book Black Mama Widow – oh man. Talk about someone writing from the true voice of a character and not flinching. I still shake when I think about that book. That is some power. Teri Woods. How many people do I see reading her books on the subway each day? Her story and will to succeed is unreal. She was a big inspiration to me. Gregory David Roberts – he wrote Shantaram – was to me, the hammer for the modern age of true entertainment and self-reflection in a novel. Total submersion. I would also say that KRS-ONE, though not traditionally thought of as someone in the literary world, was a huge inspiration to me. He gave me a solid basis on how to blend knowledge and entertainment, and I believe I have taken that with me into the world of literature. All hail The Teacher! UR: What things do you think every author should do to promote their book? CH: That is a fantastic question. Before you can even think of anyone else getting behind you to get the word out, authors should be putting themselves out there and making themselves valuable. How? I guess the first thing to do is to think about who you feel would really enjoy reading your book, and then look at where those people are. So, if you think that people who buy your book love to shop for old school basketball jerseys, go to a sports store and ask if they will carry your book. Ask if you can do a reading there. If you think that teenagers are going to like your book, find out where they hang out and think about how to get it to them. I usually go to bookstores and watch people for hours – what they look for, what they sit down and read, what they put down. Everything. The best thing to do is to look around your house or workspace, and look at the music you listen to. The movies you watch. The shows you go to. Then find the people behind that and try to get them a copy of your book. They probably have the same kind of people following them as you do, and if they like what they read, they will spread the word. Getting people to read your book is the most important thing. What I mean by people is people outside of your friends or other people in your writing communities. Take it to the people out there and see what they think. When someone reads an amazing book, they usually spread the word. Do something to make yourself stand out and connect with the reader so that they feel they are part of your journey. For me, that means talking to people, which I enjoy very much. If you’re shy, that won’t work well. Find local radio stations and go read. There are millions of people with podcasts who love to interview writers. There is no secret really. If you’re an author, look at each book as a step in your journey. If you do this, you won’t put so much pressure on one book. As you build your catalog, you will build your following. For me, I think young people are the key. Teenagers love something to get into that speaks to them but doesn’t speak at them. Even if you wrote an adult book, which I did, get it to them. I queried a bunch of high school newspapers and had them write reviews. Find people who are looking for the same break as you are and team up with them. You will bring each other up. I hope this partially answers the question. Don’t even forget that you’re holding gold in your hand. It’s your book, your soul. How bad do you want to make it go? Find celebrities or minor celebrities who travel all the time. Get the book to them. They have so much down time, they need it something to fill it with. Why not your book? Everyone should be reading your book. Each person walking around is someone who should be reading your book. I think like that. UR: Is there anything else you would like to share about yourself or your novel? CH: I think The Last Block in Harlem is very polarizing. People either find themselves very much connected and walking around the inside of the world of the novel, or on the outside wondering what they hell is going on. I guess the same could be said for myself as a writer. I can’t make apologies for any of it. For me, the people who live on this block, who have lived here for their entire lives, have read the book and gave me fantastic feedback and acknowledgements. I always ask them “Did I do right by the block?” and without an exception, they all said that I did. For me, that’s the thing that gave me great pleasure. Young and old, the people that I wrote the book for, that I wrote the book TO, get it. That being said, I have sold the book to people from all around the world and the letters I get back are mostly positive and asking when the next one is coming out. The book is meant to connect the reader with themselves. If you give in and allow yourself to take the journey and really see what’s happening, you’ll enjoy the ride. There are some haters out there who bring in their own ideals and opinions to the story and just don’t get it. That’s fair and it’s fine. I have thick skin. You have to. For me, each word I write, each book I’m going to put out, is a continuation of a long tradition. I am honored to be part of that, and motivated beyond everything else to ensure I can keep on doing it. This book was my first and I will always have a special love for it. Now it’s time to turn to the next, and listen to what the characters that are creeping into the lines about to be written are trying to tell me. Read our recent review for The Last Block in Harlem today! Order your copy of The Last Block in Harlem today! 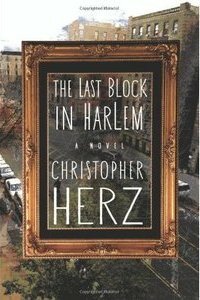 [...]Those who follow some of the self-published authors we mention on these pages may like to read this terrific interview on Christopher Herz, author of The Last Block in Harlem. The interview features on Urban Reviews.